St. Louis Cardinals 4, Boston Red Sox 3. 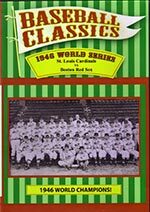 This high definition DVD includes the official World Series highlight film as well as two other films on the 1946 World Series, one on the 1946 All-Star Game at Fenway Park and vintage interviews with Johnny Pesky, Harry Brecheen and Stan Musial. The World Series features two of the game’s greatest hitters, Musial and Ted Williams, but the stars are Brecheen and Harry Walker for the Cardinals and Bobby Doerr and Rudy York for the Red Sox. Game 7 will be remembered for Enos Slaughter’s mad dash from first base to score the go-ahead run in the eighth inning. The All-Star Game features two Williams homers, including one off Rip Sewell’s “Blooper Pitch”, in the American League’s 12-0 win.